Really want to show how much you care? 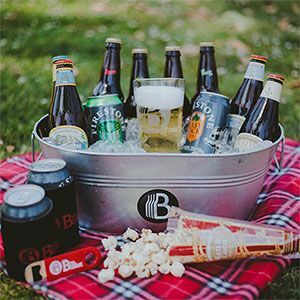 Take the time to pick out each and every beer, snack, and gift accessory -- including the basket itself -- and tell the story of why you picked each item as they unbox it. Choose the gift package: Wood crates (two colors), tin buckets and tubs, simple black box, or NFL tailgate bucket for their favorite team. Choose the beer: See the list below or to the left for craft beers, variety packs, imports, and domestics. Choose more booze: Include red wine or liquor in the basket, mixed drink packages, and cocktail mix-ins. Choose logo glassware: Pint, shot, 6 oz taster, rocks, and stemless wine glasses. Choose a theme package: These are our favorite add-ins! "Executive" with cigars and a flask, golfers, poker night, tasting kit package, or BBQ theme. Choose snacks: Candy, chocolate, chips, healthy snacks, cookies, beef jerky, sauces, and dips. Too many to list, there are more things you can add! Buying for a woman? Please note: All gifts from The Bro Basket are designed and marketed for dudes. 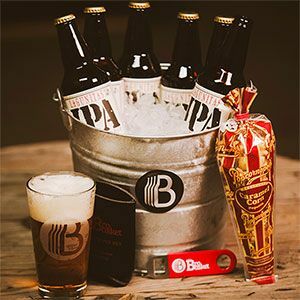 We prefer a gender-agnostic experience on our beer website but The Bro Basket has great beer gifts and offers great craft beers in them. This particular gift is not especially gender-driven, but all of the branding says "The Bro Basket" on it, so, you know. Beer nuts may be tasty, but they're kinda boring. 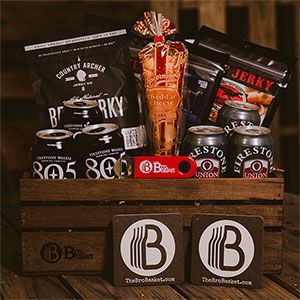 Why not give this craft beer gift basket where the beers are paired with four exciting beef jerky selections? Firestone Walker's 805 Ale and Union Jack IPA are paired with Country Archer Original beef jerky, Astig Adobo beef jerky, Carnivore Candy Sweet Picante beef jerky, and Carnivore Candy Barbecue Mesquite beef jerky. The intense flavors these jerkies hold well against the strong beers. Also included in the gift is gourmet popcorn, one pint glass, and two coasters. It all comes packed in a dark-stained wood crate to make your gift even better. When you want to make a bigger statement, this is a great beer gift to choose. It comes with 5 16-oz cans of Firestone-Walker's very popular 805 ale and 6 12-oz bottles of the also popular Stone IPA. If these aren't the right beers, you can pick two different beers to give, or you can leave a note at checkout to tell The Bro Basket what style of beer your favorite beer lover enjoys most. Please note: Your beer selections might change the price of the gift. 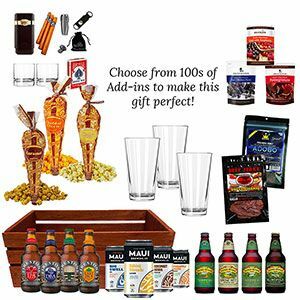 A significant amount of snacks are also included in this over-sized beer gift basket, and again, you can customize the selection if you want. 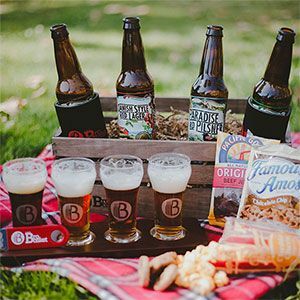 Like with the customized beers, custom snacks and other nifty gift add-ins might change the price of this gift. Also included are two logo pint glasses. 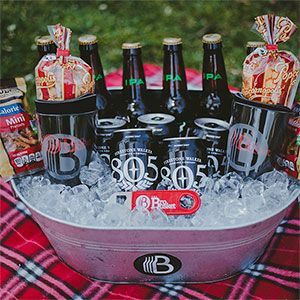 When you give this beer gift, the party can continue after the beer is all gone as the "basket" is a reusable ice tub made of trendy tin. But what the gift is packed in is secondary to the terrific selection of beers available for this gift. This gift comes with three craft beer variety packs (three different breweries, each contains four different beers) and they're based on available inventory BUT you can add a note at checkout telling The Bro Basket what your recipient's favorite beer styles are and they'll hook you up with the right beers (for example, you can tell them "IPAs only" or "No IPAs"). This gift also contains snacks: Ferrero Rocher chocolates and gourmet popcorn and a pint glass. Buying for a woman? Please note: All gifts from The Bro Basket are designed and marketed for dudes. 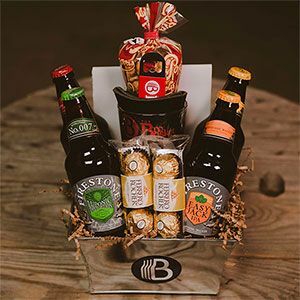 We prefer a gender-agnostic experience on our beer website but The Bro Basket has great beer gifts and offers great craft beers in them. Aside from the name, this particular gift is not especially gender-driven, but all of the branding says "The Bro Basket" on it, so, you know. Most beer gift baskets are pretty great. I mean, what beer lover doesn't want to receive beer as a gift? But this one is extra great. Between the presentation in a cool wood crate, the top-notch selection of beer tasting kits (which you can pick or go with the default Firestone Walker selection of four bottles), and yummy snacks (again, which you can pick or go with the default selection), the gift features a wood tasting paddle with four tasting-size glasses. It's a great way to experience a tasting kit, or share it with a friend. Every gift from The Bro Basket comes with a free greeting card and a bottle opener. Give six bottles of the ever-so-popular Lagunitas IPA and gourmet snacks presented in a reusable gift bucket. Whether your beer lover's favorite is Coor's Light or Blue Moon (or several other domestic options), they'll love this bucket of beers. Stick with the Coor's Light option or pick your own. 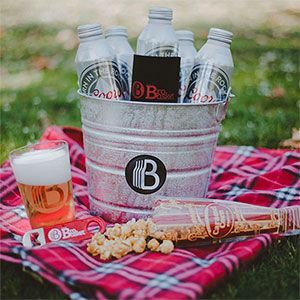 This gift includes gourmet popcorn and a pint glass, and it all comes packed in a trendy tin gift bucket. Want it delivered cold? They can do that! Delivered on ice and ready to drink for an additional $19.95. Guinness was first created in Ireland in 1725 and is known around the world for a smooth mouthfeel that comes from a mixture of nitrogen and carbon dioxide. Combined with a low alcohol content, just 4% ABV, Guinness Draught is an easy-drinking beer that's hugely popular. 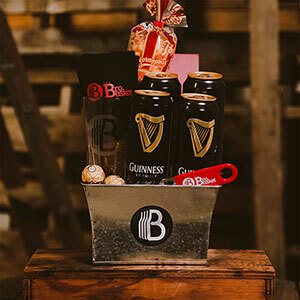 Packed in a cardboard gift box, these four Guinness are accompanied by gourmet popcorn, Ferraro Rocher chocolates, and a pint glass. Affordable IPA beer basket gifts are a little hard to come by, because the beer itself costs more, but this one isn't just a great gift, it has great IPAs in it, too. 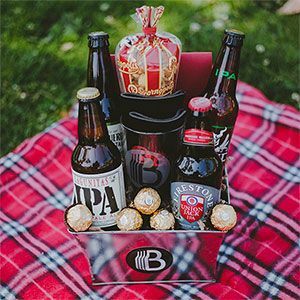 The selection of IPAs included varies based on inventory when you buy the gift, but based on the selection of craft beer and craft IPA available at The Bro Basket, we think you'll still be an IPA gift hero with this one. In addition to four bottles of IPA, this gift includes snacks: Ferrero Rocher chocolates and gourmet popcorn. It also includes a logo bottle opener and a logo pint glass. It all comes packed in a logo tin. Not everyone wants to spend $100 on a beer gift for their favorite craft beer lover. This gift starts at $52.90 (which includes the Adult Signature Fee), but can be customized to include more items, making it more expensive. It's great as it is, with the Firestone-Walker variety pack, or you can swap out this variety pack for one from Modern Times, Goose Island, a Firestone IPA pack, Newcastle, Victory Brewing, Kona Island, Mother Earth, Oskar Blues, Figueroa Mountain, Sierra Nevada, Stone, or Anchor Brewing. In addition to the beer, this gift includes snacks. The pre-selected snacks are gourmet popcorn and Ferraro Rocher chocolates, but again there are a host of choices for snacks that you can customize this gift to include.